Some VoIP services may only allow you to call other people using the same service, but others may allow you to call anyone who has a telephone number - including local, long distance, mobile, and international numbers. 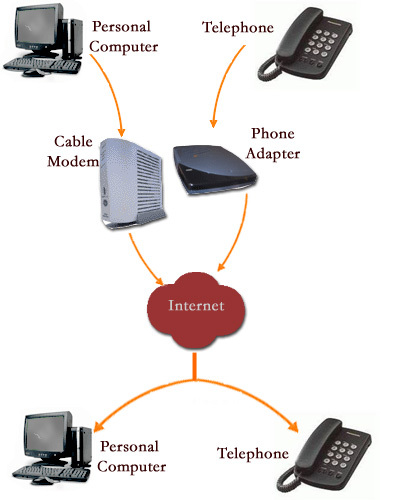 Also, while some VoIP services only work over your computer or a special VoIP phone, other services allow you to use a traditional phone connected to a VoIP adapter. Not all VoIP services connect directly to emergency services through 9-1-1. For additional information, see www.voip911.gov. Some VoIP service providers offer services that can be used wherever a high speed Internet connection available. Using a VoIP service from a new location may impact your ability to connect directly to emergency services through 9-1-1. For additional information, see www.voip911.gov. In June 2005 the FCC imposed 911 obligations on providers of “interconnected” VoIP services – VoIP services that allow users generally to make calls to and receive calls from the regular telephone network. You should know, however, that 911 calls using VoIP are handled differently than 911 calls using your regular telephone service. Please see our consumer fact sheet on VoIP and 911 services at www.voip911.gov for complete information on these differences.